This colorful salad is a show-stopper — make it for your next potluck or picnic, or amaze your family for dinner any night of the week. The recipe makes 12 portions, and you’re going to want to eat them all. 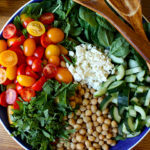 Even after it’s dressed, this salad stores well for up to three days! Quinoa and chickpeas give it a hearty serving of protein. We love the juicy tomatoes and cucumber, but the stars of the recipe are the piquant paprika dressing and the full cup of torn mint leaves. This colorful salad is a show-stopper. Make it for your next potluck or picnic, or amaze your family for dinner any night of the week.